Revolutionary Catalonia (21 July 1936 – 1939) was the part of Catalonia (an autonomous region in northeast Spain) controlled by various anarchist, communist, and socialist trade unions, parties, and militias of the Spanish Civil War period. 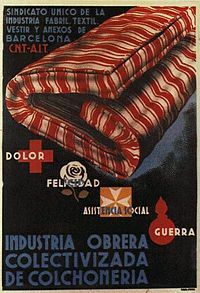 Although the Generalitat of Catalonia was nominally in power, the trade unions were de facto in command of most of the economy and military forces, which includes the Confederación Nacional del Trabajo (CNT, National Confederation of Labor) which was the dominant labor union at the time and the closely associated Federación Anarquista Ibérica (FAI, Iberian Anarchist Federation). The Unión General de Trabajadores (General Worker's Union), the POUM and the Unified Socialist Party of Catalonia (which included the Communist Party of Catalonia) were also involved. In the early 20th century, the popularity of socialism and anarchism grew throughout Spain. There was widespread discontent in Catalonia, which was heavily industrialized and was a stronghold of the anarcho-syndicalist trade unions. A series of strikes due to wage cuts and in response to military conscription for the Second Rif War in Morocco culminated in the Tragic Week (25 July – 2 August 1909) in which workers rose up in revolt and were suppressed by the army. The anarcho-syndicalist Confederación Nacional del Trabajo (CNT) was formed in October 1910 and immediately called for a general strike, which was suppressed by the military. Further strikes followed in 1917 and 1919 amidst growing violence between the police and trade unions. With the CNT outlawed, the Federación Anarquista Ibérica (FAI) was formed in 1927 as a clandestine alliance of affinity groups during the dictatorship of Miguel Primo de Rivera. Its radical members, who were also part of the CNT, exerted considerable influence on the other members of the trade union. During the Second Spanish Republic, anarchists continued to lead uprisings such as the Casas Viejas revolt in 1933 and the Asturian miners' strike of 1934 which was brutally put down by Francisco Franco with the aid of Moorish troops. Although there were early issues with production in certain instances, however, Emma Goldman attested that industrial productivity doubled almost everywhere across the country, with agricultural yields increased "30-50%". Anarchic communes often produced more than before the collectivization. The newly liberated zones worked on entirely libertarian principles; decisions were made through councils of ordinary citizens without any sort of bureaucracy. The CNT-FAI leadership was at this time not nearly as radical as the rank and file members responsible for these sweeping changes. Collectivization in the countryside generally began with the establishment of CNT-FAI committees. These committees collectivized the soil of the rich and in some cases the soil of the poor as well. Farm buildings, machinery, transport and livestock were also collectivized. Food reserves and other amenities were stored in a communal depot under committee control. In many localities, the local committee issued its own inconvertible paper money; wages were paid with this money, the size of which was determined by the size of the family. Locally produced goods were free if abundant, or bought at the communal storage. State issued convertible money was only used in trade with regions that had not adopted this system, and trade with other anarchist regions was done by barter. Since the committee controlled all the money supply, travel to another region required getting permission and convertible money from the committee. The justification for this operation (whose 'very harsh measures' shocked even some Party members) was that since all the collectives had been established by force, Líster was merely liberating the peasants. There had undoubtedly been pressure, and no doubt force was used on some occasions in the fervor after the rising. But the very fact that every village was a mixture of collectivists and individualists shows that the peasants had not been forced into communal farming at the point of a gun. After the military rebellion, the Republic was left with a decimated officer corps and a severely weakened army in the regions it still controlled. Since the army was unable to resist the rebellion, the fighting mainly fell to the militia units organized by the various labor unions. While army officers joined these columns, they were under the control of whichever organization had formed them. The militias suffered from a wide variety of problems. They were inexperienced and lacked discipline and unity of action. Rivalry between the various organizations exacerbated the lack of any centralized command and general staff. The appointed professional officers were not always respected. They also lacked heavy weapons. Militiamen would often leave the front whenever they wished. Republican officer Major Aberri said of the militiamen he encountered at the Aragon front: "It was the most natural thing in the world for them to leave the front when it was quiet. They knew nothing of discipline, and it was clear that nobody had bothered to instruct them on the subject. After a forty-hour week at the front they got bored and left it". In the days following the fighting in Barcelona, various Communist newspapers engaged in a massive propaganda campaign against the anarchists and the POUM. Pravda and the American communist Daily Worker claimed that Trotskyists and Fascists were behind the uprising. The Spanish Communist party newspapers also viciously attacked the POUM, denouncing members as traitors and fascists. The Communists, supported by the centrist faction of the Spanish Socialist Workers' Party (PSOE) under Indalecio Prieto now called for the POUM to be dissolved, but PM Largo Caballero resisted this move, and the Communists, along with their allies in the PSOE, then left the government in protest. The following crisis led to the removal of Largo Caballero by President Manuel Azaña. Azaña then appointed Juan Negrín (a centrist socialist and ally of the Communists and the Kremlin) as the new premier. The new cabinet was dominated by the Communists, center socialists and republicans, the CNT and left wing of the PSOE were not represented. The Communist Party of Spain (PCE) had now come to the fore as the most influential force in the Republican government. In Catalonia, now controlled by troops under the Command of Communist General Sebastián Pozas and newly appointed Barcelona chief of Police Ricardo Burillo, the CNT independent police patrols were dissolved and disarmed. Furthermore, the CNT were completely removed from their positions at the Franco-Spanish border posts. Another major blow to the CNT was the dissolution of countless revolutionary committees throughout Catalonia by the army and assault guards. When a new cabinet was formed by President Companys, the CNT decided not to participate. In the months that followed, the Communists carried out a campaign of arrests, tortures and assassinations against the CNT. The imprisonment of many Anarchists caused a wave of dissent in working class quarters. Meanwhile, the Communists working with Soviet agents seized most of the POUM leadership along with many of its members. The POUM secretary Andrés Nin was also arrested, sent to a secret prison in Alcalá de Henares and eventually murdered. Nin's disappearance, and the repression of the POUM, caused an international outcry from various left wing organizations and further deepened the divisions within the Republic. By 1938, the Communist party was also in control of the newly created Military Investigation Service. The SIM was virtually dominated by Communist party members, allies and Soviet agents such as Aleksandr Mikhailovich Orlov and used as a tool of political repression. According to Basque nationalist Manuel de Irujo, "hundreds and thousands of citizens" were prosecuted by SIM tribunals and tortured in the SIM's secret prisons. Repression by the SIM as well as decrees which eroded Catalan autonomy by nationalizing the Catalan war industry, ports and courts caused widespread discontent in Catalonia amongst all social classes. Relations worsened between the Generalitat and the central government of Negrín, now based in Barcelona with the resignation of Jaime Aiguadé, representative of the Republican Left of Catalonia (ERC) party in the government and Manuel de Irujo, the Basque Nationalist minister. There was now widespread hostility amongst Republicans, Catalans, Basques and Socialists towards the Negrin government. As the Communists were forced to rely more and more on their dominance of the military and police, morale declined at the front as countless dissenting anarchists, republicans and socialists were arrested or shot by commissars and SIM agents. Between July and November 1938 the Republican forces launched their largest offensive yet which was designed to reconnect their divided territory with Catalonia. Lacking in air support, armor and heavy artillery, the Popular army was soundly defeated in the disastrous Battle of the Ebro. According to Beevor, losses were as high as 30,000 on the Republican side. The Popular army was practically destroyed. It was the last action of the International Brigades and the Republican air force. On December 23, Nationalist forces launched their assault on Catalonia. By now, most Catalans were demoralized and tired of the fighting. Alienated by the Negrin government and the Communist party's nationalization of industry, the CNT was filled with defeatism and internal division. Pi Sunyer, mayor of Barcelona and a leader of the ERC, told President Azaña that "the Catalans no longer knew why they were fighting, because of Negrín's anti-Catalan policy." Catalonia was swiftly conquered by Nationalist troops. After 4 days of aerial bombardment (between 21 and 25 January), Barcelona fell on January 26. Afterwards there followed five days of looting and extrajudicial killings by the Nationalist troops. Between 400,000 and 500,000 refugees including the defeated Army of Catalonia crossed the border into France. With the Nationalists now in control, Catalan autonomy was abolished. The Catalan language, the Sardana and Catalan Christian names were forbidden. All the Catalan newspapers were requisitioned and the forbidden books retired and burned. Austrian author Franz Borkenau was sharply critical of the anarchists in Catalonia. In a book which was also very critical of the Soviet Union-backed Communists, he described the terror which they had inflicted on Barcelona residents and their environment. Everybody created his own justice and administered it himself...Some used to call this 'taking a person for a ride' [paseo] but I maintain that it was justice administered directly by the people in the complete absence of the regular judicial bodies. We do not wish to deny that the nineteenth of July brought with it an overflowing of passions and abuses, a natural phenomenon of the transfer of power from the hands of privileged to the hands of the people. It is possible that our victory resulted in the death by violence of four or five thousand inhabitants of Catalonia who were listed as rightists and were linked to political or ecclesiastical reaction. Because of its role as a leading supporter of the Nationalist cause, the Catholic Church came under attack throughout the region. Church buildings were burned or taken over by the CNT or by supporters of the Republican government and turned into warehouses or put to other secular uses. Thousands of members of the Catholic clergy were tortured and killed and many more fled the country or sought refuge in foreign embassies. ^ Bolloten, Burnett (1991). The Spanish Civil war: Revolution and counter-revolution. University of North Carolina Press. p. 192. ^ Address to the International Working Men's Association Congress by Emma Goldman. ^ a b Bolloten 1991, p. 55. ^ a b Bolloten 1991, p. 57. ^ Bolloten 1991, p. 60. ^ Bolloten 1991, pp. 223–224. ^ Bolloten 1991, p. 224. ^ Fabregas, Joan P; Tarradellas, Josep (24 October 1936). 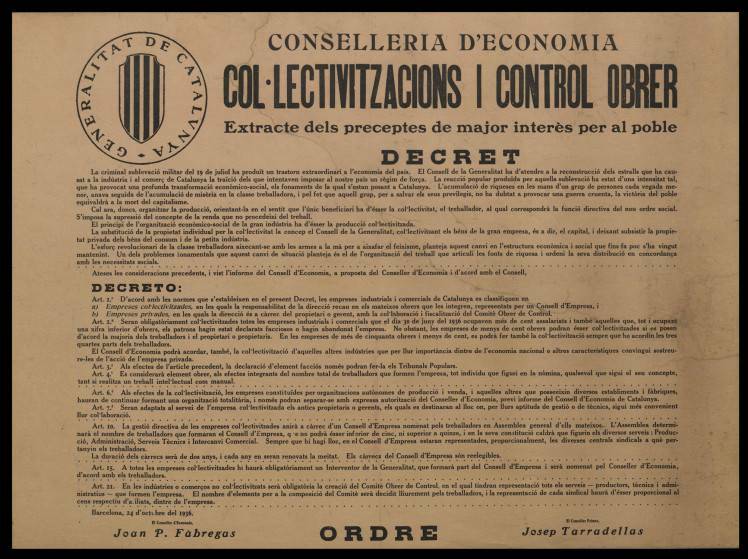 "Col·lectivitzacions i Control Obrer". ^ Tarradellas, Josep; Fabregas, Joan P (28 October 1936). "Diari Oficial de la Generalitat de Catalunya" (PDF): 373–376. ^ Bolloten, 1991 & 223-224. ^ Bolloten 1991, p. 225. ^ Bolloten 1991, p. 227. ^ a b Bolloten 1991, p. 58. ^ Goldman, Emma (2006). Vision on Fire: Emma Goldman on the Spanish Revolution (PDF). AK Press. pp. 81, 84. ISBN 978-1904859574. ^ a b Beevor 2006, p. 107. ^ Bolloten, 1991 & p62. ^ Bolloten, 1991 & p65-66. ^ Bolloten, 1991 & p66. ^ Bolloten, 1991 & p63-64. ^ a b Bolloten, 1991 & p75. ^ Bolloten, 1991 & p76. ^ Bolloten 1991, p. 242. ^ a b Kelsey, Graham (1991). Anarchosyndicalism, Libertarian Communism, and the State: The CNT in Zaragoza and Aragon, 1930-1937. Dordrecht: Kluwer Academic, International Institute of Social History. p. 161. ISBN 0-7923-0275-3. ^ Bolloten, 1991 & p83-84. ^ Bolloten 1991, p. 250. ^ Bolloten 1991, p. 254. ^ Bolloten 1991, p. 256. ^ Bolloten 1991, p. 259. ^ Bolloten 1991, p. 261. ^ Ibárruri 1984, p. 382. ^ Bolloten 1991, pp. 273–275. ^ Bolloten 1991, p. 277. ^ Bolloten 1991, pp. 322–4. ^ Bolloten 1991, pp. 326-7. ^ Bolloten 1991, p. 330. ^ Bolloten 1991, p. 333. ^ Bolloten 1991, p. 488. ^ Borkenau, Franz (1974). The Spanish Cockpit. University of Michigan Press. p. 178. ^ Stephen D. Mumford. The Life and Death of NSSM 200, pages 263-266. ^ Beevor, Antony (2006). The Battle for Spain, the Spanish Civil War, 1936-1939. Penguin. p. 87. Beevor, Antony (2006) . The Battle for Spain: The Spanish Civil War 1936–1939. London: Weidenfeld & Nicolson. ISBN 0-297-84832-1. First published as The Spanish Civil War.